Today we are excited to announce that a2z Scrapbooking is now partnering with Hero Arts to be the exclusive site, other than Hero Arts themselves, to purchase all Hero Arts Digital Kits! If you have never used digital or think you can’t use digital fear not, we have 16 exciting stops on the hop to show you how, plus 3 videos. a2z Scrapbooking is giving away a $50 Gift Certificate to one lucky winner. The prize winner will be randomly selected from ALL comments received on the participating designers’ blogs. The more comments you leave along the hop, the better your odds of winning, so be sure to leave a little love at each blog, including this one! This is your last stop on the hop. You should have arrived here from the very talented, Hero Arts Designer Kelly Rasmussen. 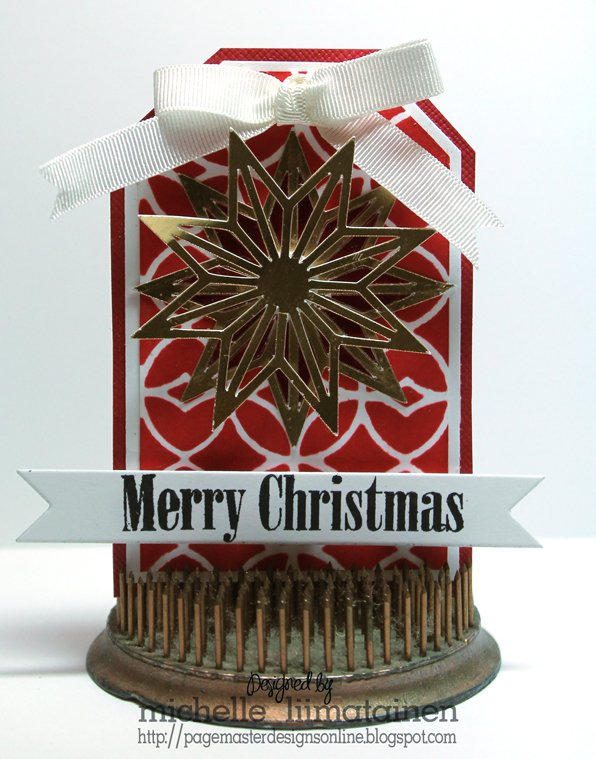 For this tag I cut the Christmas ornament from the Retro Holiday kit out of two different colored Foiled papers. I swapped out the colors to make a unique ornament. I used some Distress Ink and a Tim Holtz Stencil to create the background. 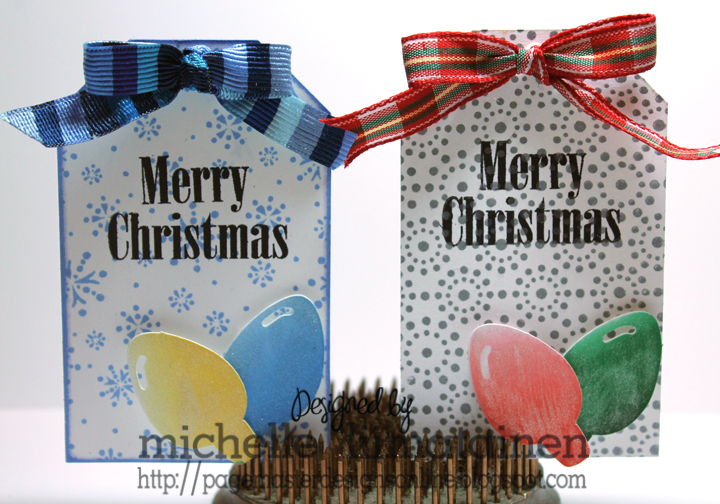 The tag was also cut using the Holiday Houses file from the kit I used in the card above. 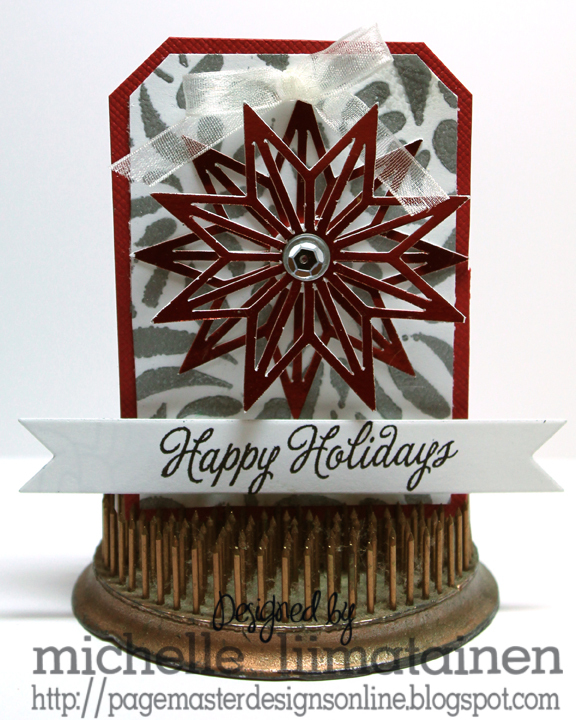 For this one I used the same Tim Holtz stencil for the background but this time I cut two of those gorgeous snowflake stamps from the Retro Holiday Kit and layered them with a pop dot in between them. Lastly I used two more of the red snowflake stars from the Retro Holiday kit and layered them on top of the Dancing Rain Stencil, inked in Hero Arts Silver Ink, for a unique look. In case you missed the video on my personal blog I am adding it below. 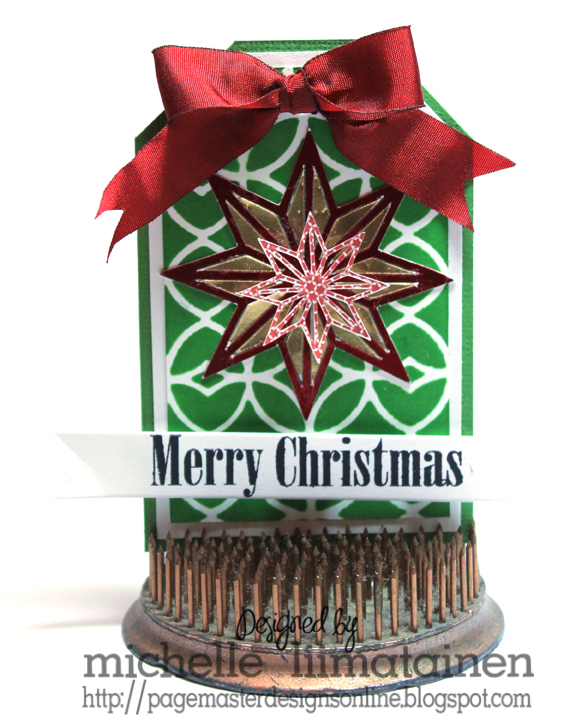 In this video you will learn how to use the Hero Arts Digital CUT FILE KITS. You will learn the difference between SVG files and DXF and you will discover that you do not need the Silhouette Studio Designer Edition to use these files. We hope you had fun today….and that you learned a lot. We are working as fast as we can to get ALL the Hero Arts Digital Kits into the store. In the meantime if you would like to shop you can use the discount code MICHELLE15 for 15% off your order. Thanks so much for hopping with us today. You have until Sunday August 31, 2014 11:59 EST to comment on each blog. Winner will be announced on September 3rd. Good Luck. Categories: Digital | Tags: Blog Hop, card, Digital, Hero Arts, Print & Cut, Silhouette, Tags, Tutorial | Permalink. Oh so much great inspiration on this blog and every one on the hop. Thanks for sharing all these talented people and their ideas. I love blog hops! Wonderful projects! I really love all the dimension in these and what a great hop, thanks to all! Absolutely AMAZING! I’m so inspired by each and every designer that joined the hop and also by all the fabulous new ideas I have seen today! I have always enjoying creating with Hero’s Digital Line and am super excited that a2z is now selling the line exclusively….and that’s i’m part of the wonderful new Design Team! I thank you all for sharing you talent and really wish I had been able to take part….! You all ROCK!! Great work !! Thank you for the wonderful step by step instructions. Such gorgeous projects. Thanks for sharing all your amazing ideas!!!! Michelle all of your projects are fabulous and your tutorials are very easy to follow I think you may have convinced me to try a digital card or tag. I’m very excited to have your company on board with Hero Arts I just love them and I have a good feeling about this match up thanks for a great hop! Thank you so much for this really comprehensive post, Michelle! Your card is so pretty, and I love how you played with all the digi files for your tags! I have bookmarked this page for reference, because your tutorials were really awesome…can’t wait to start playing with my files ~ Yay!!! Wonderful projects and inspirations!! Thanks for the great tutorial! 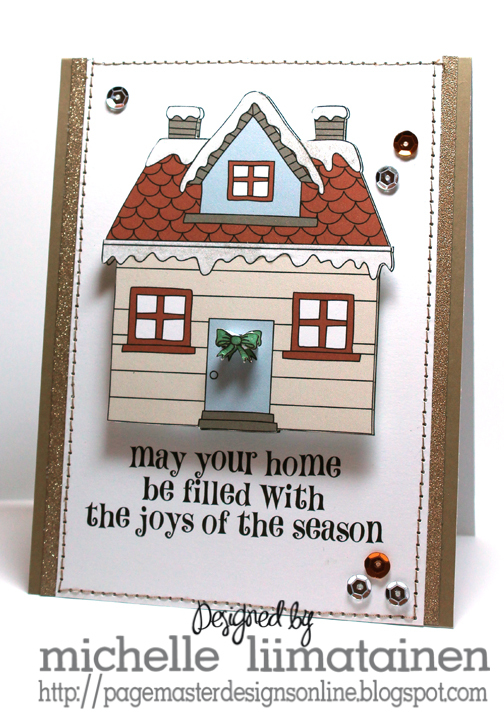 I love all the dimension and sequins on your house card, Michelle! The tags are fabulous, too! Wow, this is very helpful for a beginner. Your explanation was very clear. . Love the tags. Wonderful projects and great ideas. Its been a really great blog hop. Thank you to all for sharing such great ideas. I really enjoyed the videos and all the great tips! 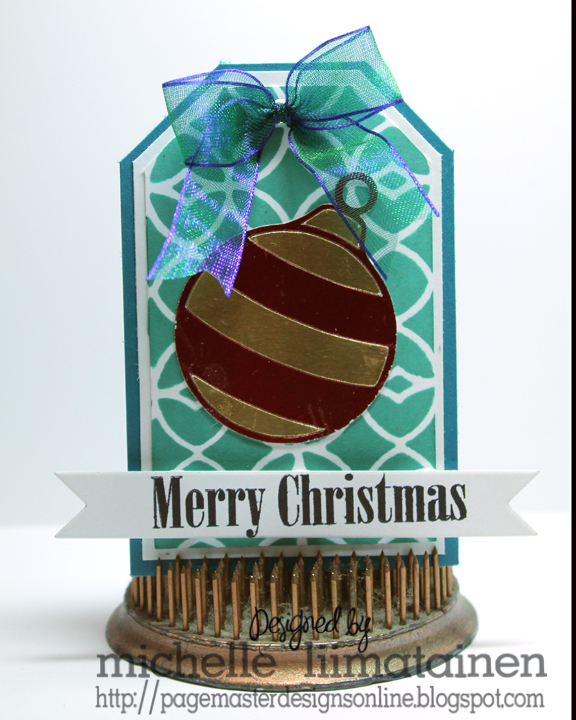 wonderful projects…love the layering and dimension you created on them. Fabulous projects! I love how versatile the digital images are. I’ve enjoyed all the hopping these past few days! Really liked the tags on this last one, the way they were created, and the adorable stamps with the sayings, too. Fabulous projects and thanks for the tutorials for them. I have never done anything digital, but this hop has enlightened me in so many ways!! Wow! Such an amazing blog hop, I enjoyed every stop and beautiful card design along the way! Thank you for the great video tutorials, Michelle! I especially liked learning how to use digital files as prints and cuts on the Silhouette! Can’t wait to try this! Thanks! Great video tutorials. Love the projects. That was a fun inspiring hop. I really like seeing all the different ideas for digital files and all the tutorials for how to work with them. I have some but don’t use them much so this will help alot. Thanks so much. These are all so gorgeous; I’m so excited to get my hands on some of these digital kits and start making some Christmas cards! !